I have a 2000 LT 4x4 with a newly rebuilt engine. I want to start doing more off road trips and was wondering if anyone has tried/used the Volant air filters. I am looking to keep my engine as cool as possible! Do those things really work? Well to start a "cold air intake" doesn't actually do anything in the way of cooling a motor. The radiator and rest of the cooling system do that. The cold air intake is "suppose" to allow more and cooler air into the intake for combustion purposes. 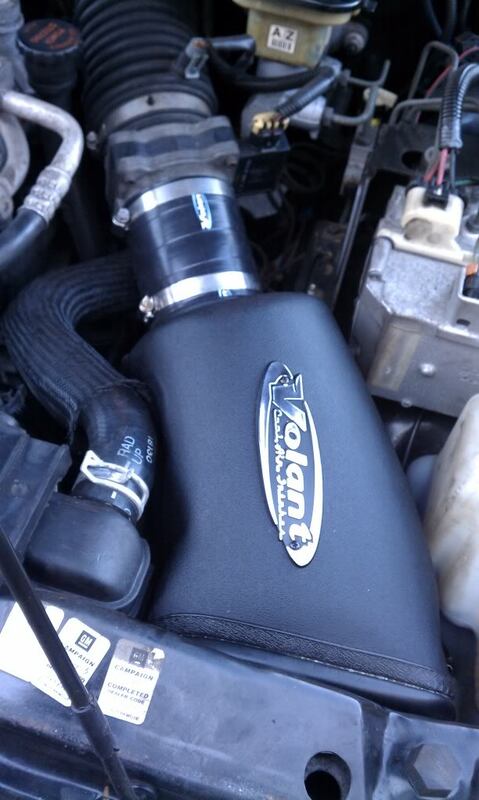 I have a Volant and I love it cause it looks good under my hood lol! To be honest that is really all it does besides make a little noise when you floor it. I'm sure it may add a hp or two but nothing noticeable that's for sure. Given the chance to purchase another I can't truly say if I'd spend the money again or not. Here's what it looks like in a blazer if your curious. Yeah the "cold" part to it means that it draws in cold air to the engine. Cool air burns better than hot air. To better cool your engine upgrade your fan to an efan and maybe cut some vent holes in your hood. Amazing--your build thread is where I first saw the Volant filter! LOL! BTW--your Blazer is awesome--nice work you've done to it. Newby need help Bogging down!!! Newby questions....350 to 383 conv.